After the successful theme purchase you will receive an email including your individual theme download link. With this link you can download your Baylys theme folder (.zip file). 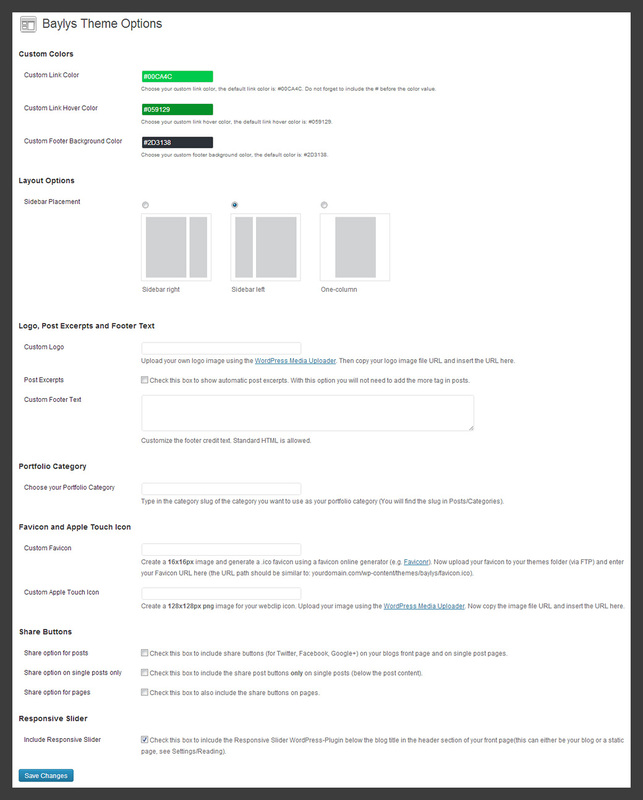 WordPress admin panel and choose the “Install themes” tab menu. At the top of the page you find the smaller navigation link “Upload”. Via this link you an choose to upload your the baylys.zip file and click the “Install now” button. The Baylys theme will now be your active theme. Alternatively you can also install the theme directly to your server with a FTP client (e.g. Filezilla). Just drop the un-ziped Baylys theme folder into your …/wp-content/themes/ folder. Now you can see the Baylys theme in your WordPress admin panel under “Appearance / Themes / Available Themes”. From there you can activate the Baylys theme. On the theme options page at “Appearance / Theme Options” you can find several easy-to-use options to customize your Baylys theme (see a screenshot of the theme options). First you can choose your own link color, link hover color and the footer background color by typing in a hex color value (#……) or by just clicking into the color field and using the color picker to choose your own colors. Now you can choose if you want to use the Baylys theme with a right sidebar, a left sidebar or in the single column layout options without a sidebar. Next you can upload your own logo image via the media uploader and include the image file URL into the custom logo theme option. It’s best to use a transparent PNG as a logo image. The logo image size is not fixed, but a 250 x 40 pixel image (or similar) is recommended. If you want to customize the themes footer text (see Copyright, WordPress link and theme info link) you can include your own footer text in the theme option Custom Footer Text. If you want to use Bayls Portfolio page template on your site (see Portfolio example at the Baylys live demo), you can choose the ctegory slug of the category you want to use as your portfolio category. You can find the correct cetgory slugs under “Posts / Categories”. To include your own favicon you need to create a 16×16 pixel jpg image and generate a .ico favicon file using and online favicon generator (like faviconr.com). Now you have to upload the favicon.ico file into your Baylys theme folder via an FTP client and paste the favicon URL into the “Custom Favicon” text field on your theme options page. The Baylys theme also supports an Apple touch icon, so your blog can be saved with a nice App-like icon on iOS devices. Just create an 128×128 png image and upload your image using the media uploader. Copy and paste the file URL into the Custom Apple Touch Icon text field. You don’t need to create rounded corners or any glossy effects for your icon since Apple renders your icon automatically with these effects. To use Baylys with an image slider on the front page you have to install the WordPress plugin “Responsive Slider” first. After you installed and set up your slider (see admin panel Slides / Settings and Add New Slide: Your slider images should be 1400×550 pixel), you can automatically include your slider in the Baylys header area (on your front page or blog page) by checking the “Include Responsive Slider” checkbox on the theme options page. Additionally to the options on the theme options page you can also use the Header Image option (Appearance / Header) and the Custom Background option (Appearance / Background). You can use one of the included header images or just upload your own images in the size of 1400x550px. If you upload more then one header image you can choose the “Random images” option to rotate your header image on page load. You can also customize the background of your blog with a different background color or by uploading a custom background image. You can find this option in the admin panel under “Appearance / Background”. You can either choose a background image (e.g. a pattern image) or a color as your background. If you choose a background image you should make sure that the file size of your image is not very large in file size so that it will not take too long to load your website into the browser. In the admin panel under “Appearance / Menus” you can set up your 2 custom menus for the Primary Navigation (at the right top of the header area) and the optional Footer Navigation (at the bottom of the footer). The optional footer navigation does not support sub menus. The Baylys theme offers 3 main widget areas, the Left Sidebar widget area, the Right Sidebar and the Footer Widget Area with the widget areas “Footer One-Column, Footer 2-Columns Left and Footer 2-Columns Right” (to include widgets in the footer in a single-column or two-column layout). With the Social Links widget you have the option to link to your different social profile sites like Twitter, Facebook, Google+, YouTube, Flickr and many more via nice looking social icons. Just paste the URLs you want to include into the provided URL field and save your settings. At the bottom of the widget you can also choose to open all links in a new or in the same browser window. The Baylys About widget offers you an easy option to tell your readers more about you and also include a profile picture in the widget. You can include your picture URL, the width and height value of the image (without px) and anabout text (you can include HTML code in the text). To post a video just select the video post format and paste the embed iframe code from a YouTube or Vimeo video into your post. If you have trouble embedding the iframe code (in some cases the iframe code gets deleted after saving or editing a video post) you can install the Iframe WordPress plugin. For the gallery post format you can just upload some images to your post using the WordPresss “Add Media” uploader button. Inside the media upload lightbox window you can choose “Create a gallery” and select your images. The WordPress gallery shortcode “gallery” will be included automatically into your post. Your image thumbnails should be at least 250px in width. You can change the thumbnail size via “Settings / Media” in the WordPress admin panel. If you are using Baylys Portfolio page template your thumbnails settings should be set to 340 x 280 px and the “Crop thumbnails” checkbox should be checked. If you need to resize older thumbnail images you can use the WordPress plugin “Regenerate Thumbnails”. To use the Image post format just include an image in your post as usual using the “Upload/Insert” media uploader. Images should have a width of 890px. On pages you can choose custom Baylys page templates at “Page Attributes / Temptlate”. The Fullwidth page template works great to include the multicolumn shortcodes (see Shortcodes). With the Baylys Portfolio page template (see a portfolio example in the Baylys live demo) you can create a page showing a preview with thumbnails of all your post in the portfolio category (you set up on the theme options page). Your thumnail image settings should be set to 340 x 280 px with the “Crop thumbnails” checkbox should be checked. To include the portfolio intro text just write some text on your portfolio page. If you want to show an author description text at the end of each standard post you only need to fill out the “Biographical Info” in the WordPress user profile. You can also insert links or other standard HTML. Baylys offers shortcodes for for multicolumn content, info boxes and buttons. You can find all shortcode codes ready to copy/paste on the Shortcode example page at the Baylys live demo. Baylys is ready for theme trans­la­tions. You can add your own trans­la­tion or cust­o­mize an exis­ting trans­la­tion easily using the WordPress plugin Codestyling Localization. You can also find a detailed plugin description on the plugin homepage. If you want to cust­o­mize the Baylys theme a little further and you the­re­fore want to change the code in the styleeheet (style.css) or in any of the theme tem­plate files please con­sider crea­ting a child theme for your changes. Using a child theme is actually quite easy and it saves all your indi­vi­dual changes from being over­written by a future update of the Baylys parent theme. You can find more infor­ma­tion on crea­ting a child theme in the article “WordPress Child Theme Basics” on the Themeshaper blog. To get started you can download the sample child theme folder at the Baylys theme page (Download: Baylys Child-Theme).